This web page contains background info on how I became familiar with radar rainfall conversion and is no longer updated. Info includes DBZ Rainfall rates, Wunderground weather stations, and what can go wrong does. Or to quote from a man of experience, Cousin Woodman, "Good judgment comes from experience, and experience -- well, that comes from poor judgment." ...in spades. I didn't know then what I know now, that you have to adjust the radar... not the rain gages!!! Wunderground rainfall accumulation parameter 'dailyrainin' is now preferred over 'HourlyPrecipIn' because some gages may be true hourly rates but others are a lagging moving 60 minute total, and some are really odd, so be safer than sorry and use dailyrainin. This goes along way in explaining dead wasps in some tipping buckets here. Getrealtime.exe was updated 7/2/2012 to convert the Wunderground accumulating dailyrainin values to unit increments. My expert Dave in Alabama tells me I have pilots all wrong and also the Kxxx Wunderground precip at Airports. He points out that the NWS empty and reset their precip buckets at 7 minutes till the hour every hour. What a job that must be. So Kxxx Wunderground airport precip parameter 'PrecipitationIn' now works in GetRealtime.exe. Sorry about that pilots but I still wouldn't fly in the rain and airport time steps are all screwy anyway. 13) Additional comparisons for winter snowfall and radar performance discussions can be seen here. You might ask why all my sites are located in the southern US. Well, I did not know that NEXRAD radar worked when it snowed... live and learn (those are some smart guys at NEXRAD headquarters!). I have now added comparisons with snow water content gauges in the western Sierra Nevadas that doesn't make those guys at headquarters look to smart after all. 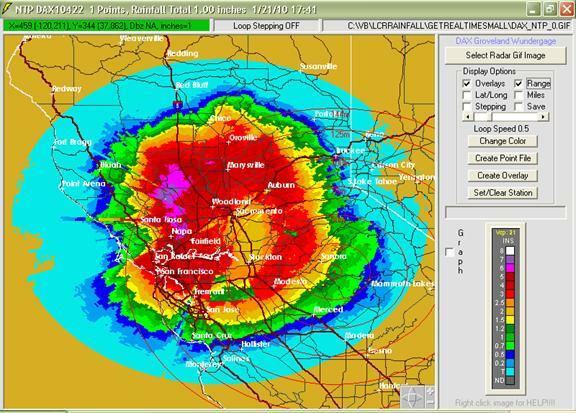 Additionally, NEXRAD comparisons with a professional network of tipping buckets are on my Rainfall-Runoff Comparisons web page for Las Vegas Valley, Nv. A storm moved through the KFLCORAL5 weather station area today (June 8, 09) and the N0R and NCR correlated well with the weather station reported total rainfall amount. The N1P 1-hour total had a bug that has been fixed and is now available for download. The above graph of the 5-minute rainfall amounts paint a different picture. Although the N0R and NCR values agree, their distribution is certainly different than those reported by the weather station. Perhaps the rain fell as hail and had to melt to be recorded by the weather station??? Hence it's even distribution that seems odd for a rapidly moving thunderstorm. I quess the NWS can melt hail faster? 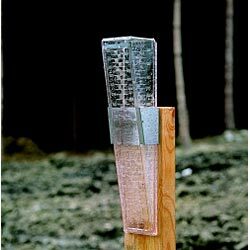 If anyone is following along I switched to this new rain gage. It agrees with the results for the gage above, but it appears even better maintained. My method used for the N1P 5-minute values in the tables below were computed as the change in the Nexrad values and has been subsequently abandoned because of its unreliable results. The N1P is now simply the the N1P value as a 1 hour rate just like N0R and NCR which means it lags and averages the rainfall record over an hour period... which is fine for larger basins and IF the N1P wasn't so lousy anyway! It looks like the N0R radar image is the best of the lot. The NCR and N1P were not even in the ballpark. The time lag between N0R rainfall and Wunderground seems to be due to something peculiar to Wunderground. The radar clearly showed this small storm had moved out of the area yet Wunderground was still reporting rainfall 30 minutes later. I would like to pick a Wunderground gage in my area for visual confirmation, but it never rains in the desert! Ok, it’s on my list. Here are daily rainfalls for the past week. I think N1P and NCR are shown not to be worth further comparisons. What say you?!! Temporarily had to move to Melborne MLB radar as AMX was down. Well this comparison does not look good! I have reevaluated my dbz to rainfall rates and updated Getrealtime.exe to use the log interpolation values from the following table. This will tend to lower the low rates and greatly raise the higher rates. This table seems to have been constructed from a mid range Z-R relation of the form Z=a+b*log(R) where a=27.14 and b=14.108 (a=46.96 for in/hr) and not a slightly different classical step Z=aR^b form which by the way is only a statistical, not a physical thing. It seems to work really well so if anyone can tell me more about this Z-R please comment or email me. And isn't there some statistical rule against just reversing the dependent and independant variables in a regression formula to get rain rates. I guess that is the least of the problems here. Update 8/17/10: It turns out the rates above are actually not mid range such as 22.5 but actually the standard convective WSR-88D rates at the stated dbz. So color green 20 dbz >>> 200R^1.4 gives the right value stated of 0.02 in/hr. Well that is a load off! But what is with the 5 dbz color bins and not the 0.5 dbz resolution of the radar??? This is not 1988 with just 16 colors anymore. You may want to limit the maximum rainfall rates for your point of interest. Proper use of adaptable parameters. "As mentioned earlier, several adaptable parameters have a bearing on the precipitation algorithm. Two such adaptable parameters are the Z/R relationship and the maximum precipitation rate (MXPRA). The default Z/R relationship in the WSR-88D is the Convective Z=300R1.4, and the default MXPRA was established at 53 dBZ which equates to a maximum rainfall rate of 103.8 mm/hr (4.09 in/hr). This value was established to eliminate the effects of hail contamination on rainfall estimates, but on occasion, rainfall rates of greater than 103.8 mm/hr were observed." Comparison 6/24/09: Miami AMX radar back up and was used for this comparison. It looks like the new dbz to rainfall rate may be helping. That’s it. I’m getting a new Wundergage. One on a golf course that would have a need to maintain an accurate rainfall record. KFLPOMPA12 looks like a good choice about 5 miles south. After finally asking for help on N1P, the Nexrad Radar Operations Center directed me to their Handbook FMH-11, Part C. Chapter 3.3 tells us that the N1P (hourly priciptation) may be adjusted for gage-radar bias but the adjustment is a single value applied to the whole radar coverage. This is why one should ALWAYS double check their own sub area of interest's gage bias and make your own adustment to the N0R reflectivity Z-R relation as needed. I'M KIDDING!!!! I'm not as foolish as Lewis Carol! Ok, that's it. I have installed a rain gage outside my office window (305,244) and will be doing the next rainfall comparison myself with binoculars and a timer. Rocket science would be easier than getting a rainfall record. My Plastic Gage is located 19 miles north of the ESX radar, mid-beam base scan elevation = 6,010 ft. It could be weeks if not months for the next desert rainfall here… but I’m ready now! After again noting peak N0R 5 minute rainfall versus KFLCORAL5 tipping bucket constant drizzle I have once again moved back to nearby Wundergage KFLPARKL4 that shows similar peaks as N0R for the last storm... Storm Chaser!!! Wunderground rain gauge is located 52 miles north of AMX radar site. After KFLPARKL4 reported only 10% of the 5-minute actual rainfall on July 13, 2010 I have moved back to nearby KFLBOCAR4 that reported a nice spiked 2.37 inch down pour. GetRealtime.exe 1.3.9 has been updated to change the 1-Hour Total N1P rainfall calculation to the same used as N0R and NCR. Trying to work with the change in N1P values on a regular time step wasn't working out. The event totals are now correct but the high intensity 5 minute events are now averaged over several time steps so that's not very good for small basin runoff computations. Oh well, N1P always way under reports rainfall anyway and should not be used no how. I continue charting the N1P just to prove this point. OOPS!!! Wouldn't you know my very next chart shows N1P performing better than N0R. Ok, but it's still a rule of thumb. and were put into use on August 30, 2010. The continuous NEXRAD point rainfall 5-minute record sequence and the tipping bucket sequence of computed runoff for a hypothedical 1 square mile basin has been computed below in real-time by GetRealtime. A 1-hour lag was chosen so as not to cripple the N1P 5-minute record right off the bat. This elimanates any actual basin characteristcs and shows the effect of only the difference in rainfall records. The MAE here is the mean absolute error of daily percent differences between the tipping bucket and the radar peak flows. Wunderground rain gauge is located 33 miles northwest of FWS radar site, mid-beam base scan elevation = 3,160 ft. Moved to KTXDALLA70 after July 30, 2010 and then back on Oct 1, 2010.. Moved back to KTXDALLA46 beginning Oct 1, 2010. Wunderground rain gauge is located 72 miles north of FWS radar site, mid-beam base scan elevation = 6,950 ft. The Wundergage KTXCOLLI1 at Collinsville has been down since 9/25/2010 and so the nearby KTXWHITE10 and its radar pixel was filling inthrough 3/8/2011. This Wunder Gage comparison is now using 2 radar sites, DAX located 91 miles to the northwest and HNX located 111 miles to the south. The range of the display for these radar sites are 143 miles. It will be interesting to see how much of a difference a radar site calibration, beam elevation, and/or its distance will make. So far it looks like most of the winter rainfall is occurring below the 10,000 foot scan elevation of the radar beam with the closer (and lower beam) DAX radar doing better than the further HNX radar. I'll even go out on a limb here and say, "This is the worst radar site in the nation!" Oh wait... I'm adding some snow water equivilant radar comparisons at the 7,000 foot elevation that will make this lame site look peachy! The two radar sites, DAX atenna at elevation 141 ft, HNX at 338 ft, lowest angle 0.5 radar beams at 91 and 111 mile range will be measuring two different elevations of scan volumes over the Wundergage as shown below. Wunderground rain gauge is located 98 miles southeast of the DAX radar site, mid-beam base scan elevation = 9,800 ft in the Big Creek basin with Nexrad to USGS rainfall-runoff comparison here. Wunderground rain gauge is located 53 miles south of the DAX radar site, mid-beam base scan elevation = 4,200 ft. The vertical stepping on the Tracy and McFarland charts below are due to zero reported tipping bucket rainfall while the radar reports non-existant rainfall in clear air mode. Always something. Actually I may have been misled with the curvature of the earth and beam angle causing radar beam over shoot. It probably has nothing to do with that. Beam spreading and beam refraction with distance from the DAX radar site is probably the cause of under estimating rainfall beyond about 70 miles. I should have done my homework at the NWS Online School for Weather. Refraction may also explain why winter type storms are "over shot". The atmosphere denisty distribution is probably not as normal as summer type densities. If it aint one thing its another and it's a wonder anything works at all. I am so full of baloney but if you want more overshoot speculations go to my Snowfall Comparisons page. The Online School for Weather also recommends using NCR instead of N0R images for certain cases. The advantage of Composite Reflectivity is in mountainous regions. Often, the Base Reflectivity ½° elevation scan is not high enough to see over mountains. With the addition of higher elevations scans, weather information over mountain peaks can be seen. I have replaced the Groveland DAX N1P record with the NCR record beginning Feb 1, 2010. We shall see how the NCR performs. The HNX radar NCR has replaced the N1P record for Groveland also. Wunderground rain gauge is located 49 miles southeast of HNX radar site, mid-beam scan elevation = 3,900 ft.
USGS rain gauge is located 85 miles east of ESX radar site (Las Vegas). USGS rain gauge is located 112 miles southeast of ESX radar site (Las Vegas). USGS rain gauge is located 139 miles west of FSX radar site (Flagstaff). USGS rain gauge is located 138 miles northwest of IWA radar site (Phoenix). USGS rain gauge is located 131 miles southeast of ESX radar site (Las Vegas). USGS rain gauge is located 125 miles west of FSX radar site (Flagstaff). USGS rain gauge is located 119 miles northwest of IWA radar site (Phoenix). Rain gauge is located 130 miles southeast of ESX radar site (Las Vegas). Rain gauge is located 97 miles west of FSX radar site (Flagstaff). Rain gauge is located 126 miles northwest of IWA radar site (Phoenix). % Difference is the error in total rainfall, a measure of bias. As an example through 1/8/2011, the AMX radar N0R at the Ft Lauderdale tipping bucket has tended to under report the daily rainfall by 34% (% Dif) with inidividual daily rainfall being within 35% (MAE%) of the tipping bucket about half the time while the radar N1P has a 75% under bias and is within 79% only half the time... a real horror story. The continuous real-time N0R and N1P 5-minute radar rainfall record for a hypothedical basin (see above graphs) at Ft Lauderdale produce daily peak flows that tend to differ from the tipping bucket peaks by more than 66% and 98% half the time according to their listed MAE's. A little mis-leading. Not alot of values yet and the highest peak flows at each site are not so bad. For example, the chart below shows daily unsigned errors vs daily rainfall amount for Ft Lauderdale. Looks like the Snark has made a clean getaway. I should probably put some threshold on what is considered 'real rain' here or something to help these poor radars out. Statistical collary to a Snark hunt: Sure a sports handicapper could tell you who will be leading next weeks standings but if half the time he is 100% wrong on predicting next weeks game he would be out of business. Important Note: I just noticed something while viewing a looping storm in GetNexrad.exe. In very zoomed in mode there are radar cells or pixels that are just duds. They report no refelectivity at all on all images. There locations were verified on the unzoomed original image also just to be sure. Some come and go but you may want to be sure your point location is not a dud by zooming in on it. If it aint one thing it's another. For more comparisons, see a network of tipping buckets that are on my Rainfall-Runoff Comparisons web page for Las Vegas Valley, Nv. Another ongoing Nexrad radar rainfall to runoff comparison for Big Creek near Groveland, CA in the San Joaquin Valley foothills is on my web page here. For my comparisons of runoff for some very large basins (1 to 2 thousand sq.mi.) in the western Arizona deserts go here. For an on going Snowfall comparison see my Sierra Snowfall Comparisons web page. The Sierra Snowfall page also includes two SNOTEL gages near Flagstaff AZ, one near Fargo ND, and further discussion and calculation of radar beam over shoot.